Decatur, Ala. – Fine artists and crafters from across the country will display their works of art two days in May in downtown Florence, transforming the Renaissance City into a marketplace for one-of-a-kind arts and crafts. Set for May 20-21, 2017, Arts Alive attracts arts and crafts lovers from near and far, and as they and local residents browse for unique works of art in Wilson Park, artisans compete for top honors and cash prizes in a juried gallery exhibition at the Kennedy-Douglass Center for the Arts. A project of the Kennedy-Douglass Center for the Arts volunteers, Arts Alive is a juried show featuring works of art from local, regional, and national fine artists and crafters. Visitors to the show can expect to see original paintings, pottery, sculptures, fiber art, mixed media, metal, clay, jewelry, woodworking and more. The juried show takes place in the art gallery of the Kennedy-Douglass Center for the Arts. Cash prizes will be awarded for first place ($1,000), second place ($500), third place ($300); plus eleven additional artistic and merit awards will be given. Works in the gallery will also be for sale. 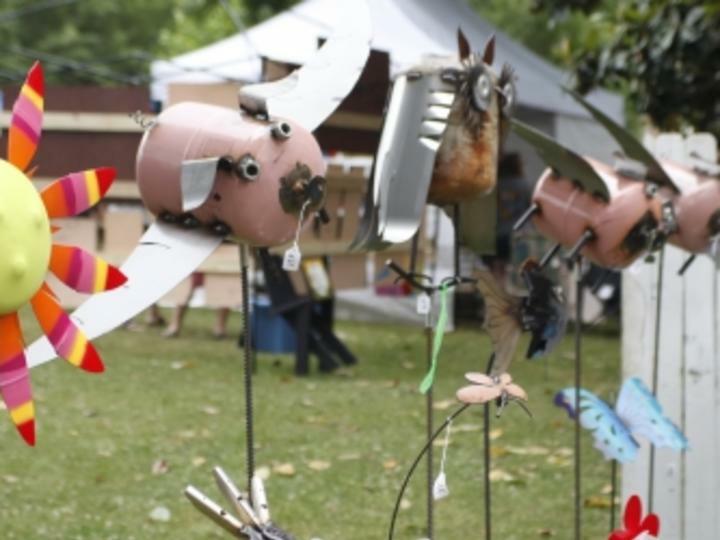 In addition to the gallery show, the art extravaganza includes artists and crafters displaying their wares in adjoining Wilson Park where festival goers enjoy a leisurely stroll through the beautiful downtown park while talking with artists and enjoying fine arts and crafts. Cash prizes will also be awarded for first place ($1,000), second place ($500), third place ($300), Best Display ($100); plus nine additional artistic and merit awards will be given. On Saturday evening, Art Under the Stars, an elegant garden party in the backyard of the Kennedy-Douglass Center, gets underway at 5:30 p.m. Patron tickets are $100 per couple, which includes entry for a drawing for an original, signed piece of art that is the basis for this year’s poster. Single tickets are $25 each (single ticket holders are not entered into the drawing). Tickets may be purchased online at www.alabamaartsalive.com/art-under-the-stars-tickets/. Festival hours are 9 a.m. to 5 p.m. on Saturday and from 10 a.m. until 5 p.m. on Sunday. Proceeds from the festival benefit children’s art-education programs in area schools. The Kennedy-Douglass Center for the Arts is located at 217 E Tuscaloosa Street in Florence. For more information on Arts Alive, visit www.alabamaartsalive.com or call 256.606-2033.